Constructing storage tanks usingHydraulic Tank Lift Jacks has become mandatory in all the leading companies in India and gradually the same is catching up all across the globe. 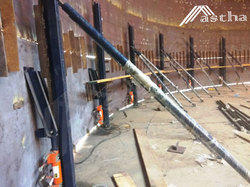 Catering to the requirements of our clients, we are involved in the offering Oil Storage Tank Lift Jacks. Bygging manufactures hydraulic jacks for tank erection since the last 33 years. Jacks with individual lift capacities of 12 ton, 18 ton and 25 ton are manufactured. So as to accomplish a high level of customer trust, we are keenly betrothed in offering a broad consignment of Heavy Lifting Tank Jack. Heavy duty tank lifting hydrolic jacks with complete accessories and power pack.